JERUSALEM - Prime Minister Shinzo Abe and his Israeli counterpart, Benjamin Netanyahu, met Wednesday to discuss ways to promote bilateral cooperation in the fields of economy and cybersecurity. 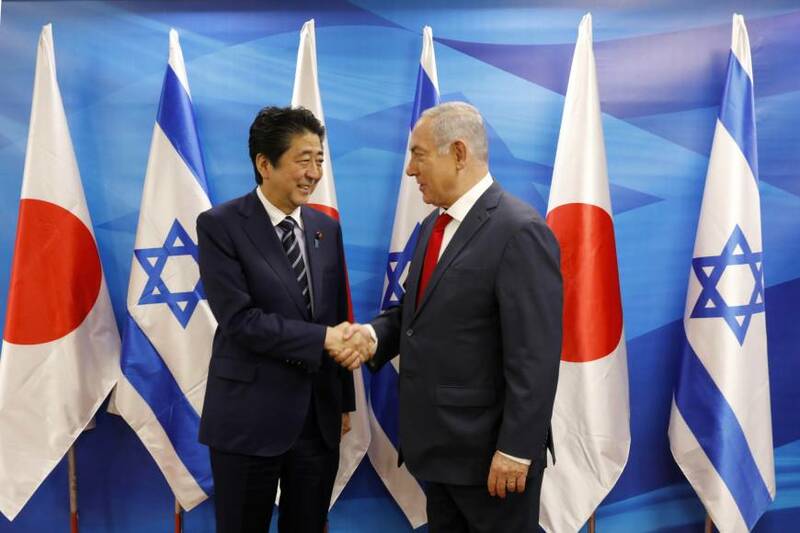 During their meeting in Jerusalem, Abe was set to talk about Middle East peace and relay Japan’s commitment to resolving the Israeli-Palestinian conflict, Japanese officials said before their talks. The meeting follows Abe’s visit to Palestine on Tuesday for talks with Palestinian President Mahmoud Abbas, making him the first leader of a major country to visit both Israel and the Palestinian territories after U.S. President Donald Trump’s controversial announcement in December that Washington. would recognize Jerusalem as Israel’s capital. 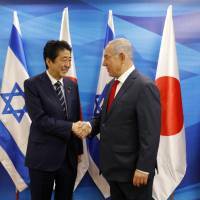 The Japanese leader said his government supports a two-state solution to resolve the Israeli-Palestinian conflict, with the final status of Jerusalem to be settled through negotiations between the concerned parties. Japan is seeking to boost cybersecurity cooperation with Israel, known for its advanced information technology, in the run-up to the 2020 Tokyo Olympics and Paralympics, the officials said. Earlier Wednesday, Abe inspected the Jericho Agro-Industrial Park in the West Bank, a flagship project of the Japanese-led Corridor for Peace and Prosperity development project that includes Israel, the Palestinian Authority and Jordan. During his five-day Middle East tour, Abe has also visited the United Arab Emirates and Jordan. He will head home Thursday.